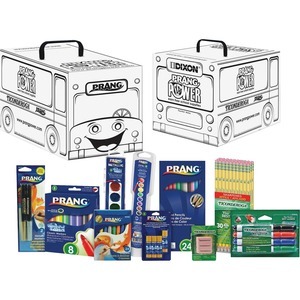 Prang Power Art Supply Kit delivers a variety of essentials for your classroom projects in a fun box decorated to look like a school bus ready to be colored in. Kit includes 30 Ticonderoga pre-sharpened No. 2 pencils, 8 washable markers, 2 pink erasers, 4 glue sticks (0.28 oz. each), 24 colored pencils, 2 metallic markers, 4 dry-erase markers, 24 crayons, Metallic Washable Watercolors and Classic Watercolors.